Now, I only quote myself (at the risk of immediately coming off pedantic) in order to correct myself. It isn’t that the characters in Fallen Kingdom lack motivation. But I found myself sitting with this film, as it rattled on boisterously in front of me, trying to pinpoint exactly why I was consistently being pulled out of the action. With each successive story beat, there was something about the characters’ actions that continued to rub me the wrong way. Initially, I blamed the motivations. For example: Why are the villains selling off dinosaurs black market-style? Sure, this storyline doesn’t have a clear arc. Aside from being greedy, we don’t know who any of these people are. (Turns out, this whole storyline is a Macguffin anyway, but that’s a different issue altogether). But it isn’t the characters’ motivations that are flawed. They’re just simple characters, and I had been mistakenly looking for depth. What is flawed is why the characters do what they do within the context of the script. With the above example, a better question is: Why does one villain do a particular nasty thing to another character in his pursuit of this goal, while doing nothing to other characters that pose a significant threat to the goal? Even when he delivers the line of dialogue that explains how he could get away with doing a nasty thing to them? The short answer is: If he did that, there’d be no movie. Heroes wouldn’t do heroic things. Villains wouldn’t be able to twirl figurative mustaches and get their comeuppance. The artifice is showing with nearly every shifting beat, every act break, each line of dialogue. It is all in service of a dark (both visually and tonally) spectacle. If that’s your bailiwick, more power to you. But the film lacks a substance, and that makes me uneasy. Yes, some of the visual renderings of the hulking dinosaurs are highly impressive. This is most noticeable on the island they initially inhabit (where we can see them in the light). 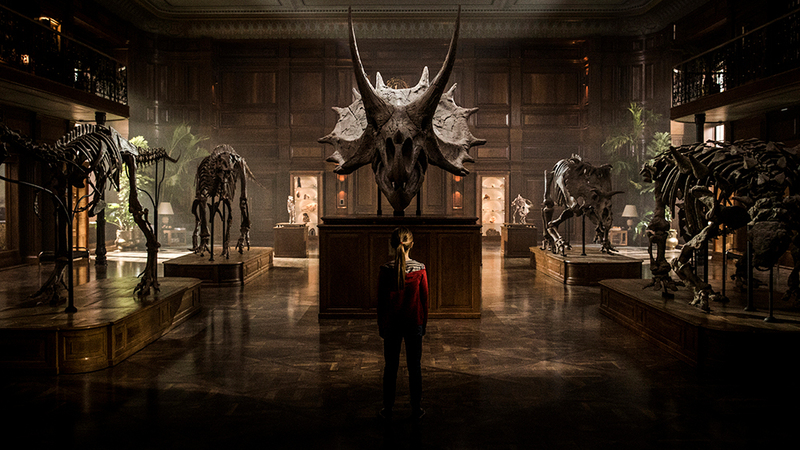 And there is a set piece here and there where Bayona takes more influence from Spielberg than Trevorrow. Trevorrow co-wrote the script, so the film is still more akin to Jurassic World than Jurassic Park. But there is a sequence in a museum that moves characters around in a similar way to the kitchen sequence in Park. You could call it style over substance, or perhaps, more appropriately, spectacle over substance. But it is hard to justify that claim, because the two are so divorced from each other that neither really functions correctly. The action can be good. It is entertaining at times. But the characters interacting in these scenes have nothing in their framework worth rooting for. To be more specific, they don’t have character arcs. Claire Dearing (Bryce Dallas Howard) and Owen Grady (Chris Pratt) would be serviceable (if not boring) protagonists without expanding their characters from the previous film, but I don’t recall either of them having meaningful character arcs in the previous film. All I can remember is that they had job titles. A character like Ian Malcolm (Jeff Goldblum), who appears briefly (briefly, briefly, briefly) in Fallen Kingdom, is interesting in Jurassic Park because he has a philosophy directly related to the action on screen. And he isn’t even one of the two leads in that film. Here, the characters barely have personalities, let alone philosophies. There is the thin veneer of a philosophical theme that bookends the film. Claire works for a dinosaur activist group, which plays little role in the plot. There is the discussion of whether these dinos are animals with rights, a discussion which leads to the heroes making a final choice that is at worst severely irresponsible and at best undoubtedly questionable. But this conversation is meaningless in execution, because there is no execution to it. No one making this film, it seems, cared enough about the conversation to factor it into the characters or the plot. It just sits at either end of the narrative like field goal posts; there’s just empty air in-between. What results from this series of veneers—the empty characters, lazy thematic development, Macguffin-filled plotting—is a grin full of fake teeth. The only genuine aspect—the aspect where it is clear the people making the film cared about what they were doing—is the action set pieces. They are flashy and loud and violent and, occasionally, quite effective. Everything else feels phoned in.